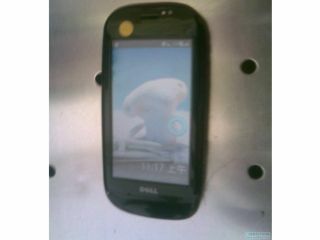 The rumours that Dell is set to release a phone are coming thicker and faster, culminating in a photo of a handset bearing the Dell name. While it could be nothing more than a photoshopped picture photographed by an iPhone (until the 3.2MP version comes of course iPhone fans), it looks the business. Rumoured by the Chinese website PDA Fans to be coming at the end of the year, it certainly fits in with Dell's previously rumoured plans. Word is that it's running Android, has a responsive capacitive touchscreen and those on the forum are apparently 'disappointed' by the prototype (according to Google Translate). There's not a lot more information on the phone (well, no more actually) and Dell has obviously been tight-lipped recently over the matter. If this takes until the end of the year to launch, it had better be a real cracker, as the likes of the iPhone 3G S, Palm Pre and countless other Samsung, LG, Nokia and Sony Ericsson phones will have moved mobile innovation to the next level.